Over 20% of all flights arrive late, as per the U.S. Department of Transportation statistics. This can lead to disruptions in your plans, if not accounted for. Moreover, on top of that, Bad Weather accounts for nearly half of all flights delayed or cancelled. 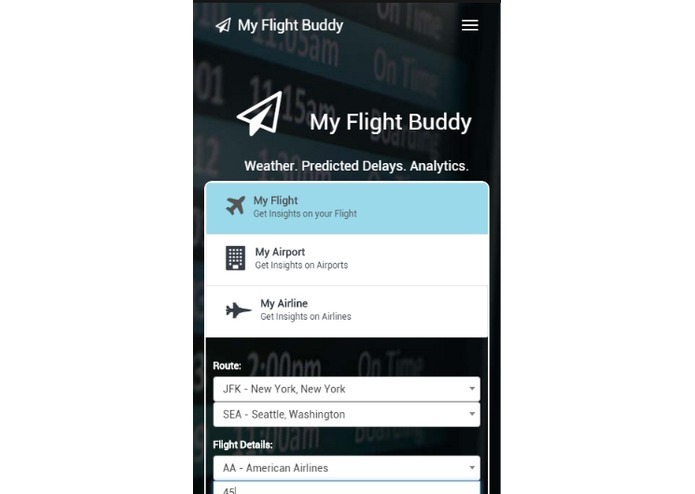 As frequent flyers, we felt that an app based on actual facts and figures can help travellers like us in making informed decisions about their upcoming travel. 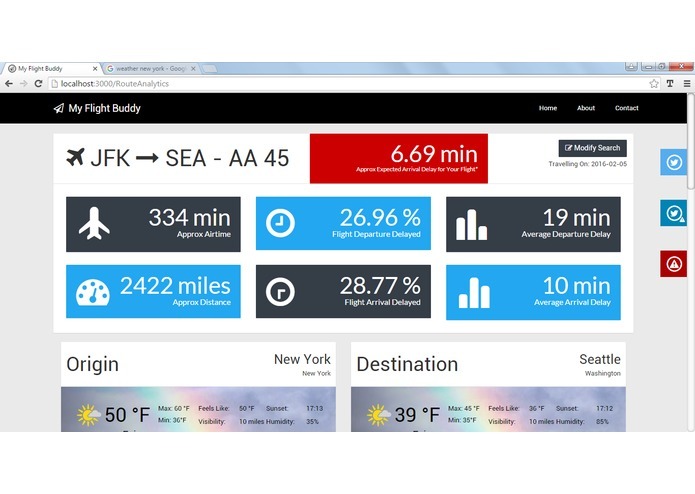 Knowing Weather before-hand as well as detailed awareness on Airline and Airport On-Time Performance can help us to plan itineraries effectively. Current Events, be it Weather Alerts or Happenings in the city of departure and destination, can also help in preparing for the journey. 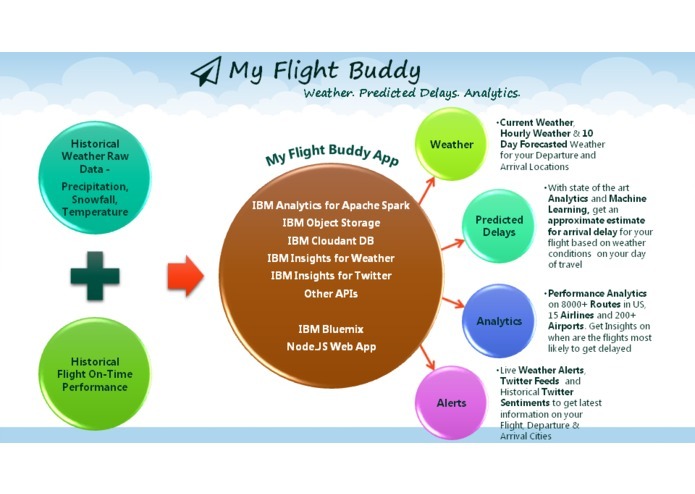 And so, My Flight Buddy was designed and developed to leverage Big Data Analytics and Machine Learning. 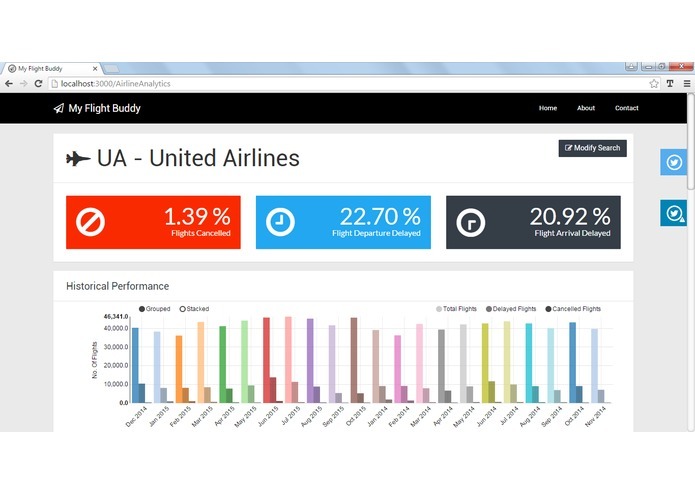 Analytics on Route, Airline and Airports: Performance Analytics on 8000+ Routes in US, 15 Airlines and 200+ Airports. 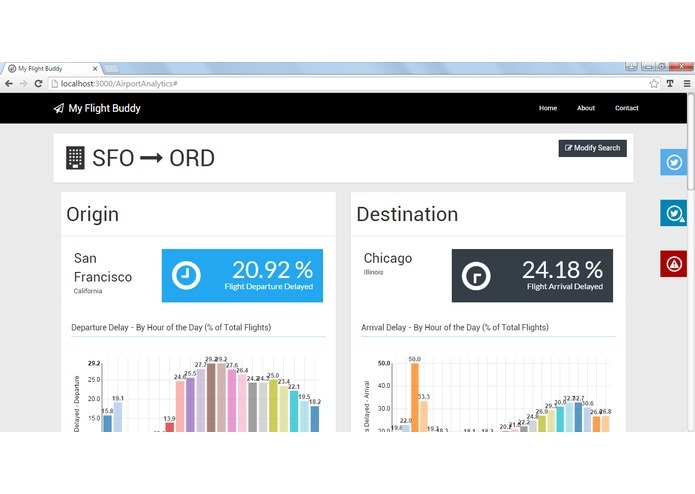 Get Insights on when are the flights most likely to get delayed based on hour of day or day of week. 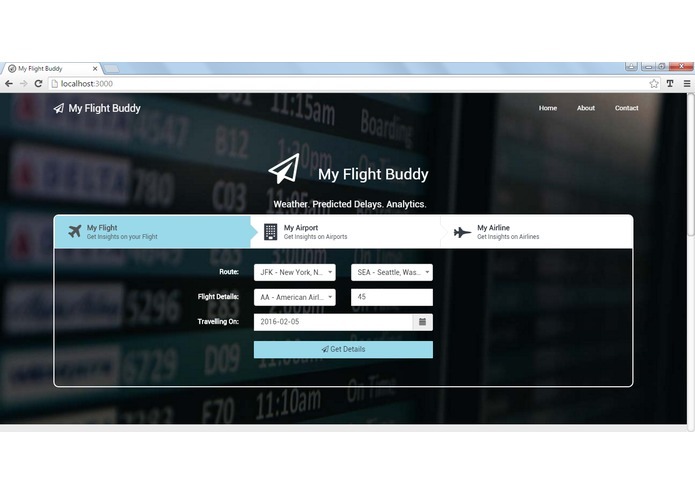 Responsive Application: My Flight Buddy is designed and developed so that it can be used seamlessly across Web Browsers on PC as well as Mobile/Tablet devices. 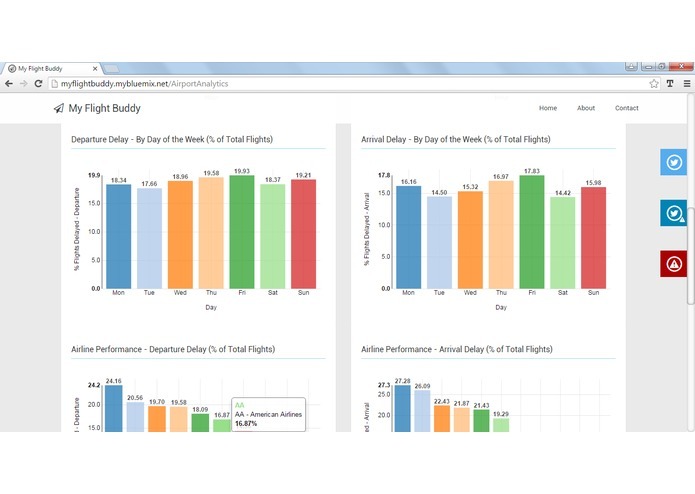 My Flight Buddy uses On-Time Performance Data of all US domestic flights for approx last 2 years to gather insights on performance of airlines, airports and routes. 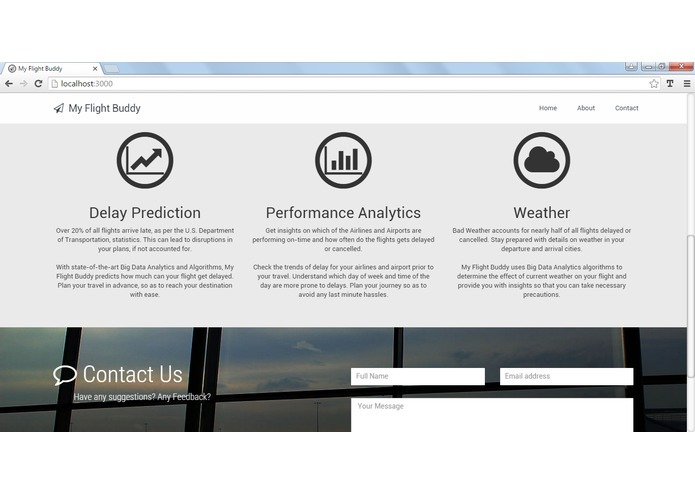 The Delay data is, then co-related with the actual weather condition on the day of flight, to build a Linear Regression Model for Arrival Delay, against Precipitation, Snowfall and Temperatures. 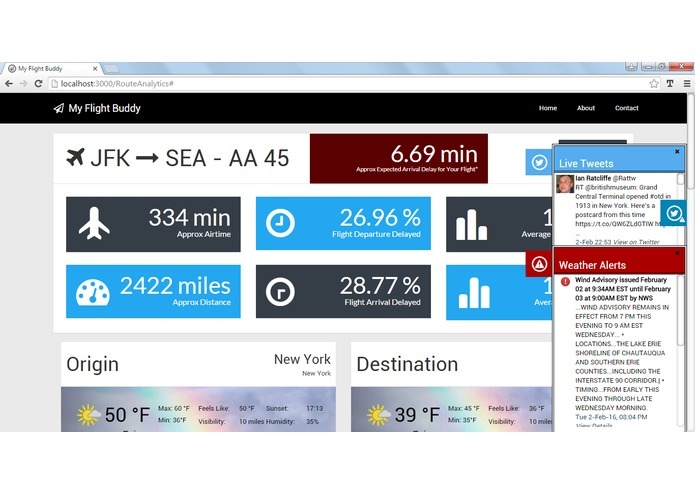 This model, is then, used to provide an estimate to the user for the approx delay his flight may incur based on weather data on the day of his travel. 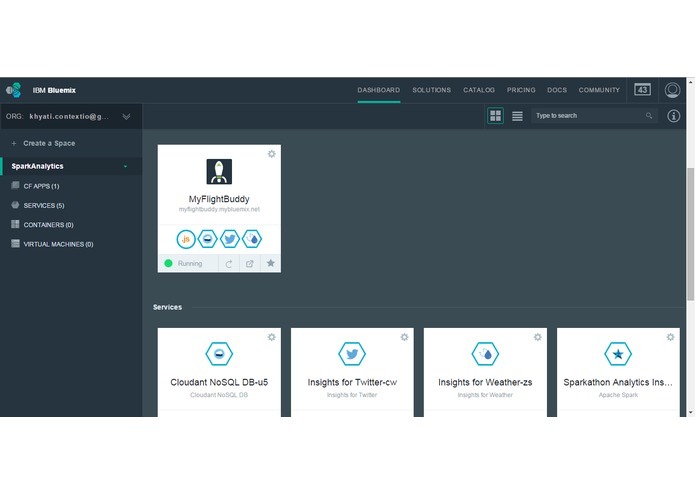 Node.js based Web Application was built and hosted on IBM Bluemix to interface with users. 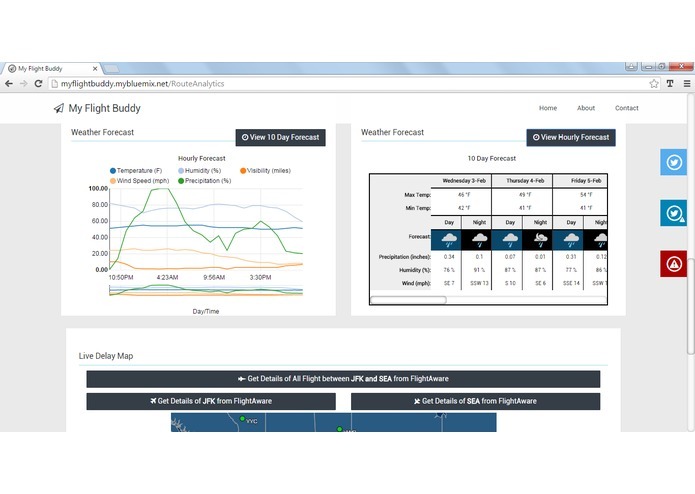 Through the web application, user can see details of Current Weather & 10-day forecast, which is fetched using IBM Insights for Weather. Currently My Flight Buddy analyses more than 2.5 GB of data for last two years. 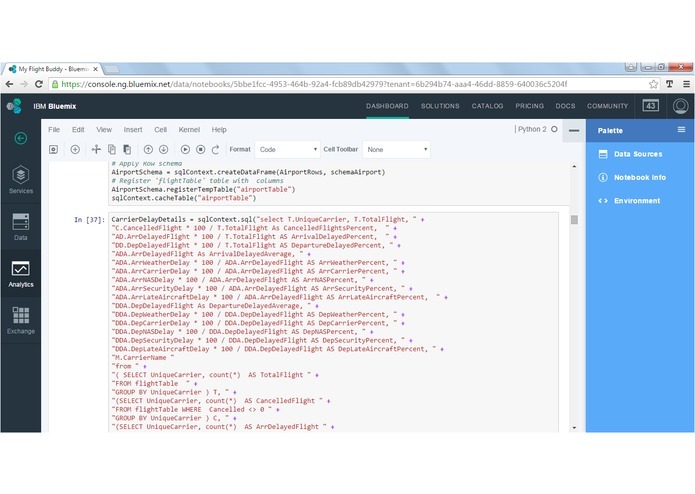 Going forward, the architecture can be based on a scheduled job on IBM Analytics for Apache Spark, (via Spark-Submit) to import and get monthly insights into the Cloudant database so that the user can get updated information, at all times. Delay is lesser earlier in the day. This probably is because the delay keeps on piling up throughout the day as the day progresses. Late Aircraft is one of the major reason for Flight Delay. Weather and Carrier also plays an important role in the delay. June and December are the months where the % of flights getting delayed is more for most of the Airlines. Is it because of the holiday season rush?! Larger Airport may not necessarily mean more delay in Flights. This was our first web application developed using the technologies mentioned and we are proud of learning these and completing the entry on time. For sure, we learnt that Apache Spark is a brilliant platform for big data analysis. 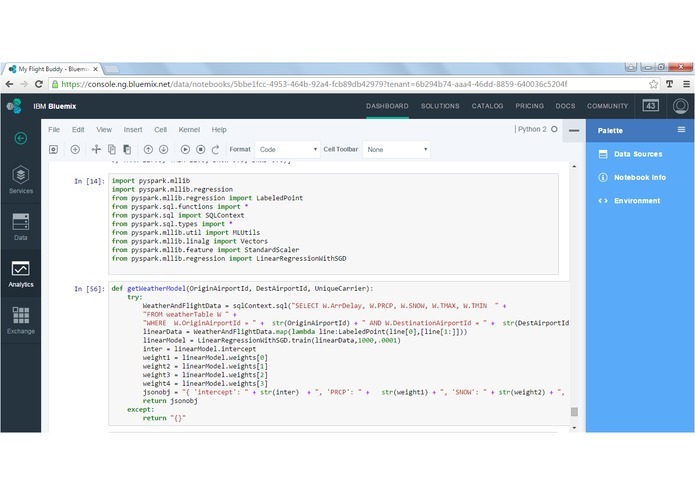 Computations which took hours on other platforms that we have used, were completed in minutes on Apache Spark hosted on IBM Bluemix. Almost, all the technologies used at the server end & for analytics, were a first for us and so was a great learning experience. The current RSquared value for the Delay Predication Model is 0.27. This can be further improved by incorporating other dependent variables into the model, like the Hour of Flight, Rolling Averages of Precipitation and Snowfall. 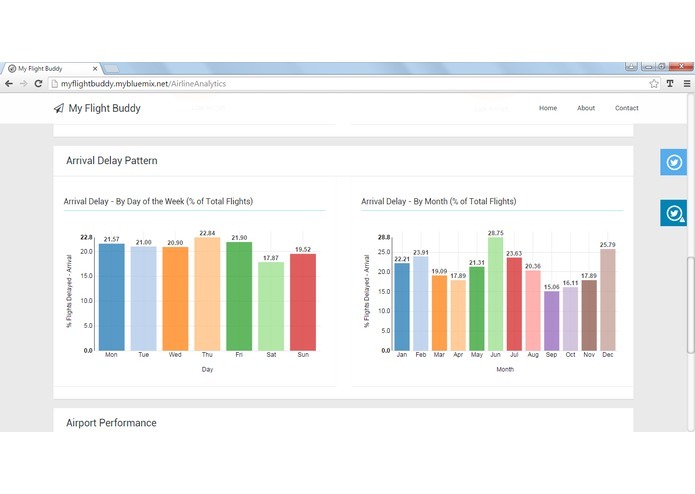 Global Presence: My Flight Buddy can use flight on-time performance data for other countries, where available, and provide analytics for them as well. Spark RDD will be great feature to use!